When checking in bags at the airport, the front desk agent typically places small barcode stickers on the checked bags. If using self-service check-ins, the printed luggage tags often come with a few small barcode stickers that (I believe) we're supposed to stick to the bags. What's the point in placing small barcode stickers on one's check-in bags? I'm assuming that one reason is serving as a backup in case the main baggage tag is lost or damaged. Is that a correct assumption, and are there more reasons behind using those small barcode stickers? You've guessed the answer correctly - they are a backup in case the main tag is removed from the bag during transit. Most baggage tags contain at least 2 (sometimes 3) of these smaller "stub" stickers, although generally the check-in staff will only attach one to the bag. 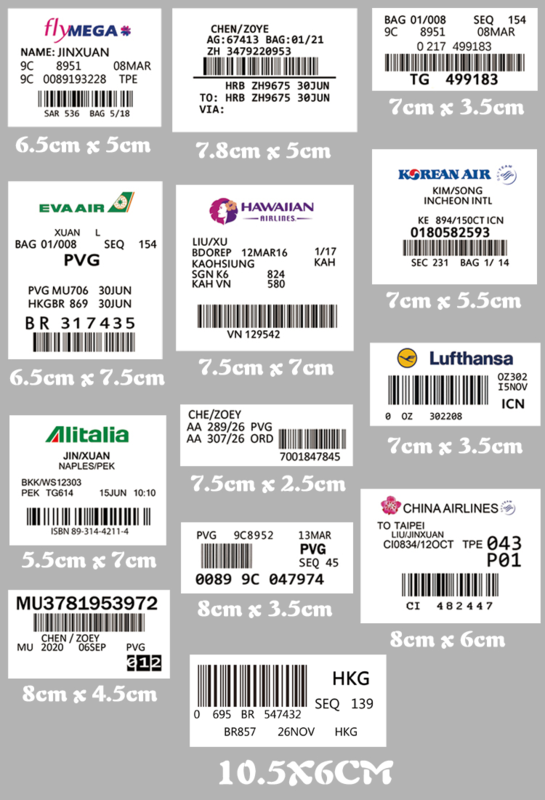 The barcode on the backup stickers contain the same number as is on the main tag, however they do not contain details of where the bag is being routed to like the main baggage tag does. Whilst the barcode systems could potentially use either the large or small barcodes, they are generally configured to only use the larger ones on the main tag to avoid conflicts with older stubs. In the even that the main tag is removed/destroyed, the stub details can be used to find the details of the bag and to reprint the full tag. As per your examples, they do generally contain printed details of things like the airline/date, which can be used to determine which is the "current" sticker (if there are multiple on the bag) and which airline the bag belongs to. As Doc has said, they are used as a spare sticker in case the normal tag is lost. They are also used by handling agencies to create what we would call "bingo sheets" at my airport, when loading using cargo containers. When a passenger can't or decides not to board the flight the bag has to be off loaded for safety reasons. I'm sure you can imagine the time it would take to go through 400 bags in order to find one with the correct tag. So what you do is print out papers with slots for these stickers, and then every time you load a bag into the container, you pull the sticker from it and paste it on the bingo sheet. If a passenger won't board, you look at all the bingo sheets and know immediately which container the bag is in. More sophisticated systems use hand held scanners, but if there's anything you should to know about the airport industry it's that nobody wants to spend. Thus you commonly see equipment from the 80s/90s still used today. What's the point of government officials checking IDs on domestic flights?